The Temple Quest Slot by Big Time Gaming is a 5 reel, 4 row and 40 paylines online slot. The game has a jungle theme and you will find symbols in the form of temples, sculptures or masks. Striking and easy to recognize after a few spins, the Temple Quest has mega symbols. These have a size of 2×2, 3×3 or 4×4 symbols. This gives the game of course extra tension with each spin, because already in the basic game you can get very nice winnings. Of course, the Mega symbols have even greater significance in the Free Spins feature. Also this popular feature has Big Time Gaming installed in the Temple Quest. 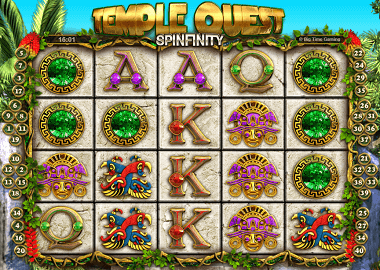 The Temple Quest Slot offers some extra features that not only promise high profits, but are also very entertaining. Minimum is £ 0.40 and the maximum bet is £400 – even high rollers are welcome. There are some cards symbols (A, K, Q), a green medallion, a parrot motif and the burial mask (maximum payout 500x your bet!). In addition, there is also a wild symbol which replaces all symbols except the scatter. Chest of Fortune feature: For this feature you need the Mega Symbol Golden Chest. As bigger the mega symbol is as more additional chests you can collect. Behind every symbol there are cash prizes of 2 to 5 times your stake. Treasure Temple feature: This feature is activates when the Princess Mega Icon turns up. You can get up to 16 keys for each symbol which the Mega Icon fills. These keys have a special meaning – each gives you cash prizes up to 100 times your stake. Free Spins Feature: The free spins feature is certainly the highlight of the Temple Quest slot. When the free spins Mega Icon lands on your reels, it is triggered. The Mega Icon can be up to 4×4 symbols. Then you get the maximum number of 16 Free Spins. During the free spins you play only with a normal reel and on the other only 4×4 Mega symbols. Fits a little symbol of Reel 1 to your mega icon – it crashes and it rains big profits! Big Time Gaming Games can be found in a variety of online casinos. For UK players, for example, offers Betspin Casino, or the providers below. Of course, we only offer UK-compliant casinos here. You play under supervised and fair conditions! Of course, if you register again, you can also grab the bonuses or bonus spins. That’s what they are for! If you click on the Temple Quest banner at the top, you can also play the slot for free.